Acadian Genealogy Homepage; CD-ROM for Acadian genealogy! Genealogy has always been a passion for many people, but computer applications have usually been limited to typing in data and getting information over the Internet that was already available in books. A CD-Rom called "In Search of our Acadian Roots" has changed that. Grand Falls native Yvon L. Cyr, who now lives in Ontario, had heard about a plan to collect genealogical information for a computer data base during the Acadian World Convention (Congrès mondial acadien) in 1994. Right then and there, he said he wanted to take part. After months passed and nothing new was heard about this project, Cyr decided to take on a similar project himself and found others interested in Acadian genealogy ready to help. This CD-Rom is the result. The concept is simple enough. All those who contributed sent in a "gedcom," a file created by genealogy software that can then be sent to someone else who can read the information on his or her own software. New information which completes a family line, fills in missing dates or places or simply corrects information already in the computer can be added, while other information is ignored. However, there are close to 150 gedcoms on this CD-Rom, resulting in more than 500,000 names. As they come from all over North America, from the Maritimes to Louisiana, from Ontario to the western United States, it can be hard to know where to start. Here's where Cyr's CD-Rom is most useful. By properly following instructions, a researcher can compare his or her own gedcom with those of the CD-Rom for possible name matches. When the list of probable matches appears, you may find your great grandfather had the same name and date of birth as the grandfather of someone living in Winnipeg, for example. Further searching will allow you to determine whether these two are in fact the same person. The name and address of the gedcom's author are included in case you want to contact that person for more information. 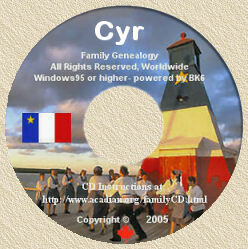 All gedcoms accepted by Cyr for the CD-Rom had this in common: the vast majority of names included had to be of Acadian origin, and names that were not Acadian had to be held by people who were of Acadian descent or who had at least married Acadians. When referring to Acadians, Cyr includes those of French-Canadian descent living in the counties of Madawaska and Victoria, as well as Aroostook County in Maine. In fact, experience has shown him that it's very hard to exclude the French Canadians "cousins" when compiling Acadian genealogical information. "In June 1980, a cardiologist put his hand on my shoulder and said, "Son, you only have six months to live...unless you allow us to perform the open-heart surgery you require." A triple bypass!" At that time, Cyr was only 39 years old and he had already suffered a second heart attack. But he wasn't about to throw in the towel. "Me, roll over and play dead? No way!" Surgery was successful and he returned to work for a different company where he was promoted five times in nine years. But in 1990, he was back in the hospital with what seemed to be a third heart attack. It turned out to be a prolonged angina attack. But the doctor ordered him to stop working. Despite his health problems, Cyr had always been active and the prospect of staying home with nothing to do at the age of 49 wasn't an enticing one. He had computers at his disposal, but he rarely had time to use them and they wound up being there for show more than anything else. Now that he had the time, he started working on learning how to fully use the computers and finding out anything he could about data processing. The discovery of the Internet brought a new world to his fingertips. At about the same time, an uncle of his from Grand Falls, Roch Cyr, brought him a lot of genealogical information and got him hooked on genealogy. He resolved to trace his family history by computer. Over the years, information was gathered and contacts were made with others interested in Acadian genealogy. The aforementionned genealogy project at the Acadian World Convention piqued his interest, and when no one seemed to be following up on this, he took it upon himself to prepare such a tool himself. At that point, not only did gedcoms come in, but shareware programme authors were offering the use of their software free of charge. This is one of the many aspects that has kept he price of the CD-Rom relatively low. "In Search of..." Article published by Marthe Arends in the Jul./Aug. 1996 Issue of her "Pioneers" Newsletter.
" In Search of..."Review which appeared in the July 18, 1995 issue of "Everton's Genealogical Helper" (Volume 1, Number 10) by Everton Publishers.
" In Search of..." Article by Jim Gaboury, published in the Spring of 1997 (Volume 11, No. 3) "Quarterly newsletter of the French-Canadian/Acadian Genealogists of Wisconcin.
" In Search of..." Article which appeared in the Oct./Nov./Dec.1995 issue of the "Genealogical Computing" Magazine. "In Search of..." Article by Rosemary Gibson Perry, editor of "Boot Your Roots" Newsletter Arizona Genealogical Computer Interest Group, published in May 1995. "In Search of..." Article by Bob Shumway, published in Volume XV, Number 2, Augyst 1995 issue of "Le Raconteur. "Acadian-Cajun Family..." Article by Leland K. Meitzler, published in the November/December 1999 issue of the Genealogy Magazine "Heritage Quest". After another operation in June 1995, a double-bypass, Cyr remains alive and well. While his half-a-million-name CD-Rom may seem quite an accomplishment in itself, this is just the beginning. When genealogists realized just how useful his research tool was, many started asking him to put out a second CD-Rom with new gedcoms they would send him. He said he would do it if he could could get at least a million names. The million-name mark was reached about a month ago. The new CD-Rom will be designed to run with Microsoft Windows, which wasn't the case with the first. However, even the first one can be read on a computer with Windows. To find matches, you place the gedcom in the proper file, go to MS-DOS prompt, follow the instructions Cyr includes and the program will run. Even those who don't have genealogy software will find the CD-Rom useful since it includes a genealogy shareware programme called "Brother's Keeper". Once this software is installed in your harddrive, you can start inputing data kept elsewhere. When there's enough data, you can create a gedcom and try to find matches. Of course, the shareware creator will have to be paid his usual shareware fee. Those who fear they don't understand enough French to work with the CD-Rom will be pleased to learn that the CD-Rom itself is English and that most of the gedcoms are English. While Acadian is almost synonymous with French-speaking in the Maritimes, this isn't necessarily the case elsewhere in Canada or in the United States. Many English-speaking people may be surprised to learn that they have Acadian roots. In addition to genealogical information per se, researchers can also find censuses of several Acadian communities from 1671 to 1777, including military censuses. There is a list of Acadians who took part in the American Revolution and a list of Acadians deported to South Carolina, as well as the names of the boats that brought them there. There is the list of passengers of the Saint-Jehan that left France in 1636 to transport many colonists to Acadia. You can even find a list of the King's Daughters, young women who were brought to New France to marry colonists. However, you will have to search a bit to actually find this information. Anyone wishing to contribute to the next CD-Rom is invited to do so, but most of the names have to be Acadian or French-Canadian, or of people who are descendants of Acadians or French-Canadians. In any case, Cyr reserves the right to reject all submissions that don't meet the established criteria. Submissions must be in the form of a gedcom sent postpaid on diskette, not through the Internet. The diskette won't be returned, however, anyone whose gedcom is used can buy the CD-Rom at a much lower price. At this time, Cyr doesn't intend to use the gedcoms that were part of his first CD-Rom, so those who want the complete collection should get both. It can be purchased directly from Yvon Cyr, but his brother Gerry, who lives in Grand Falls, also has some copies for sale. The price is $69 Can. or $49 U.S.